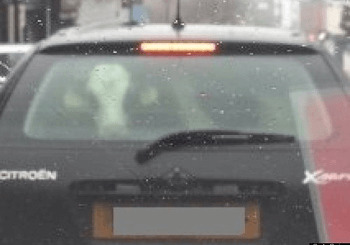 A cow was recently seen staring out of the back window of a Citroen Xsara in Ballymena, Northern Ireland. Carla Quinn was minding her own business driving on a busy Friday afternoon when she and her passenger noticed the Citroen in front of her harboured a cow! She said, “only in Ballymena would you see it”. Carla said that her fellow passenger said “you should see the size of the dog in that car – it’s the size of a cow”. After a discussion about large dogs such as Irish Wolfhounds and St Bernard’s Carla asked what colour the supposed dog was, the passenger answered that it was black. She said when the cows head came up it looked like a panda. Carla Quinn, who is an Employment Officer was suitably startled when she and her fellow passenger realised what the animal was. When the cow lifted its head and revealed its yellow ear tags it dawned on them that it was not a big dog. Carla and her companion quickly took some photos when they realised it was a cow as they thought no one would believe them if they told them they had seen a cow travelling in a car. She emailed the picture to a few friends and put it up on Facebook and Twitter. The pictures have unsurprisingly created a bit of a stir. Many of Carla’s Facebook friends were supposedly commenting and saying ‘typical Ballymena – some farmer’s bought that for the wife for Christmas and is trying to keep it secret’. When Carla showed her dad he stated that the cow was a calf which is well over a year old. We weren’t entirely sure of the legalities of carrying a cow in the back of your car here at Howards but we have read about a curious British law while trying to investigate this. Apparently the Metropolitan Streets Act 1867 prohibits the driving or conducting of any cattle through any street between the hours of 10.00 in the morning and 19:00 in the evening (except with the permission of the Commissioner of Police). The maximum penalty is a £200 fine for each head of cattle. The Police Service of Northern Ireland said though carrying a cow in a car is “ill-advised but not illegal”.